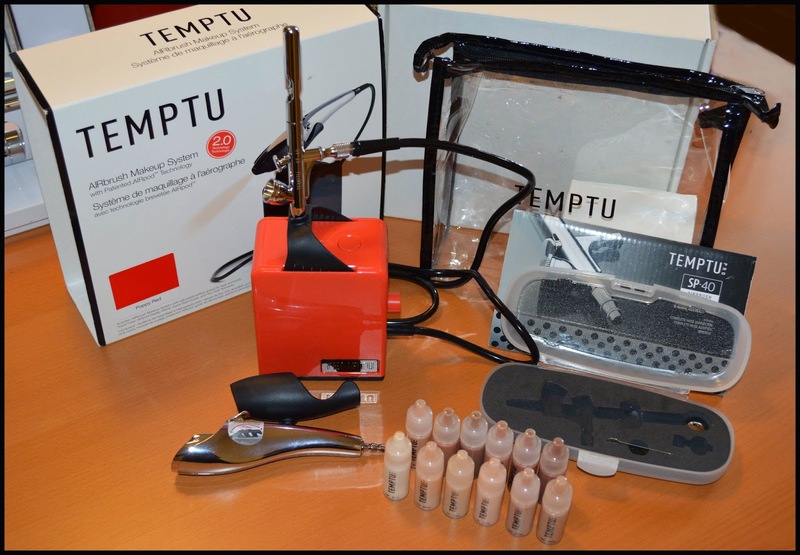 We have written extensively about Temptu in the last few months, which should not be any wonder given their status as world leading brand in silicone based makeup, among many other things. Today we are going to review Temptu's latest kit offering, called 2.0 Starter Kit, which is currently being offered on their website for 250 U$D. Let us get this out of the way right at the beginning: in our humble (but quite informed) opinion, this is simply the BEST kit combination being offered right now on the market and featuring a mains reliant compressor. The quality and quantity of the components and their value make this the best choice for a starting professional contemplating airbrush makeup. In a rather comical twist of fate, we had assembled this very same combination (with a compatible airbrush) for the students of our classes a almost a year before Temptu came up with this package, so we can't help but feel a little proud and a lot validated, even though of course we never told them about it. Let's look at this beautiful bundle up close. The compressor is Temtpu's standard 2.0 model. It is in short a slightly improved version of their very first mini compressor, gutsier and quieter than its predecessor but with the same maximum power of 30 PSI, a very remarkable strength for such a small and light unit. The 2.0 compressor will allow you to use any kind of airbrush makeup (water based, silicone based and alcohol based), and it will allow you to execute a full body painting with no major problems. It has a security shut off system that will turn off the machine after 15 minutes of continued use, but I can assure you that in years of extensive usage It never shut off on me once. The reason? It is almost statistically impossible that you will keep it running for that long without switching off if only to recharge your airbrush. So unless you have to body paint twenty people in a single session, or to do extensive FX using paints rather than makeup, this compressor will be more than adequate. Another plus of this latest edition is the colour choice, which is not restricted to black anymore, but also offers White, Hot Pink, Poppy Red (more orange than red) , Lime Green, and Light Blue. 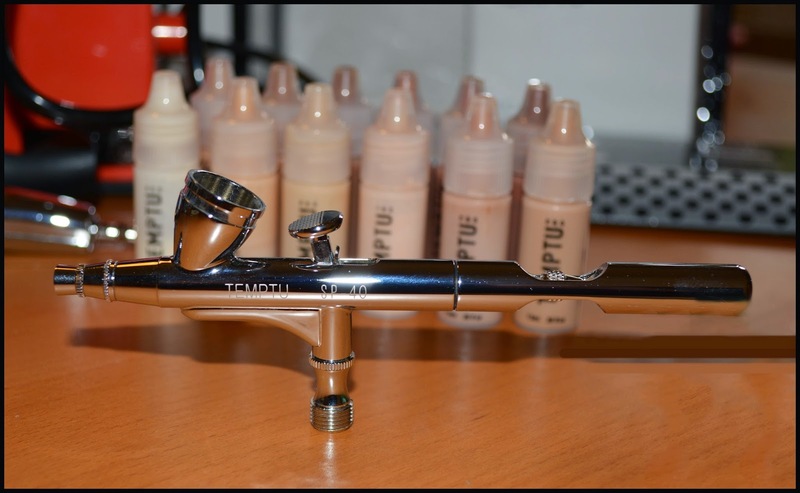 The airbrush included in this kit is a brand new model made for Temptu for this specific release, the SP-40. It looks exactly as the SP-35, the brand's trusted workhorse, but as the name suggests it has a slightly wider nozzle. You will still be able to do detail with this size, please keep in mind that we are talking a difference of points of a decimal, but the slight difference allows for a better flow, which is great especially with thicker silicone based products. A peculiarity of this airbrush is its "hybrid" mechanism, which means it is a continuous airflow airbrush, but you can also push down the trigger to make it work, as you would in a standard dual action airgun. I am saying that you can push down, not that you have to, as the act of pushing down does not have any effect whatsoever. I suspect this mode was chosen to create a transitional tool for people who are used to dual action airbrushes. If it bothers you in any way, all you have to do is unscrew the valve (easy to find in specialist shops) and replace to turn the gun in a standard dual action or a simpler "continuous airflow" tool. [For further clarification on these terms, please read this article on the subject]. The airbrush comes with a custom hose connector that will allow you to plug it in the standard hose provided with the 2.0 compressor. What is great is that you can use this very same connector to attach any other airbrush with a standard 1/8 fitting (that means most models and brands around). Also included in the kit is an AIRpod airbrush tool, that will allow you to use Temptu's proprietary AIRpod capsules. While the AIRpod line is still the one originally conceived for consumers and has a different formula and colour system than the pro S/B line, it is absolutely great to be able to experiment with it, as it can be a real time saver and a great commodity in many a situation. As for Makeup, this package includes the S/B Foundation Starter Set which means all the 12 colors in the S/B Foundation range in 1/4 oz. bottles, and a bottle of airbrush cleaner which is indispensable for silicone based makeup. We love the S/B line and have written extensively about it here. The Kit also includes an AIRPod highlighter in Gold, an excellent choice to familiarize yourself with this proprietary technology, as highlighters are really quite wonderful in this line. The presence of both the SP-40 airbrush and the AIRpod make this kit much preferable to another bundle being offered, the "Starter System " with the SE-50 Airbrush that we have also tried to less than exciting results (this model seems to be from another manufacturer and is not up to par with the SP airbrushes). We have used the 2.0 Starter Kit and many more Temptu products in our latest video tutorial, the very first fully airbrushed drag makeup video every made. We hope it will give you an idea of how fantastic this brand really is. I would love to know use!! !